Instructor MCI 8th &I Washington D.C.
Denne entered in the Marines in Jackson MS in May 1953 - served until May 1956. After boot camp at Parris Island S.C. was sent to HDQTRS MC, Henderson Hall and assigned to The Marine Corps Institute. Served entire enlistment as Instructor in the History & Foreign Languages Section of the Academic School. In addition to being Vice President, She was our Legal Advisor, and Bugler for the Gold team. Denne passed away Dec 29th in Rancho Mirage, CA. Services are pending. Born in Brandon, Mississippi in 1931, Denne Howard passed away at her home in Rancho Mirage, CA on December 29th, 2015. Denne played the bugle in high school band and stated that there was a shortage of buglers for military burial services and the high school band was often called upon to play taps. After graduation from high school, she bacame a high school band directorand then enlisted in the Marines for a 3 year term. She chose the Marines because her hero was Louis H. Wilson, a hometown favorite and Congressional Medal of Honor winner. Denne enlisted in the Marine Corps in May of 1953 and served a three year enlistment during the Korean War. When serving in the Marine Corps she had wanted to be a pilot and she also wanted to be in the United States Marine Band. Neither option was open to women in the 1950's. However, that did not stop Denne. In later years she got her private pilot's license and owned her own small plane and she joined the Marine Honor Guard Semper Fi #1 and played taps for the unit at many ceremonies at the Riverside National Cemetery. "In those days women were not afforded the same opportunities as men, such as playing in the Marine Corps Band." Denne stated. She was stationed in the Washington, D.C. area and after her discharge moved to Orange County, California where she worked in public safety communications until she retired and then attended law school at Western State University in Fullerton. Denne practiced law for over 20 years with her own estate planning and probate practice. She offered pro bond assistance at Mizell Senior Center in Palm Springs twice a month during that time. Denne has contributed much to our chapter and I always considered her our "founding mother; since she started organizing the chapter here In the Twentynthe Palms area in 2003. She announced a startup meeting; worked with active duty women Marines and searched but many former and retired Marines/ She organized the paperwork with National and after the chapter started arid then restarted again in 2007; Denne was actively pushing and pulling us into an organized unit. Denne was one of the original four members in 2007 and served as our treasurer for several years. Denne also represented the chapter at Marine Corps JROTC awards program. 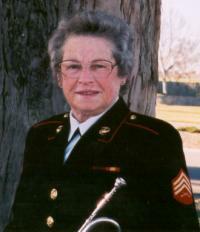 She played taps at the memorial services conducted at the Women Marines Association conventions. On behalf of all members, I know that we can thank her for making us the active chapter thaj we are today. Our chapter will have a special remembrance of Denne at our next Chapter meeting oh January 23rd. I am hoping that most of you can attend and we can share bur memories together as a group. Photos provided courtesy of Dee Dee Rodler and will be available until 5/1/2016.